In a debate in the New Zealand parliament, Michael Cullen, the country's finance minister, was assailed by a barrage of questions regarding the recent influx of immigrants and the effects that they were having on the economy. "What we wanted the Minister to understand was that these Orcs are not integrating well into our society and it is starting to have very adverse implications," said Winston Billingsworth of the New Zealand First Party. Several years ago there was a great influx from the middle-earth into New Zealand. They were brought with promises of a great future in a land were the trees are strong and their roots go deep, where they could forge a new order in the fires of industry. However the reality is that many are struggling to learn English or to find a trade. 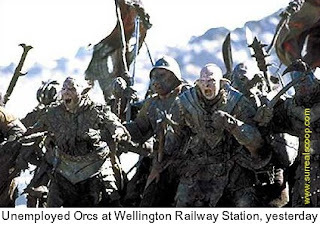 "As you walk around our great cities from Auckland to Wellington to Isengard, you are never far from being accosted by one of these Uruk-Hai black-fellas asking you to spare a few cents," said Mr Billingsworth. "They carry an air of menace about them as they brandish their rusty scimitar under your nose." Whilst New Zealand by its very history is welcoming of immigrants into a land of opportunity, many Kiwis feel that their country is being over-run and their way of life threatened. "It isn't just the cities, the hills are covered with thousands of Orcs all massing and drinking cheap liquor." said Billingsworth. "They aren't capable of getting a job and though the Government denies this, they are responsible for nearly all scimitar related murders. I don't think the rise in victims of cannibalistic disembowelments is unrelated either." New Zealand, a sparsely populated country with ten times as many sheep as people, is a mainly rural country and it is in the small towns that the feeling against the 'people of wretchedness' (as they prefer to be called) is strongest. "To be honest, it was OK when they kept themselves to themselves," said the MP for Orthanc. "Indeed their battles with the Elves were very spectacular and provided a great source of entertainment. Now that they have nothing to do they are just turning our towns into ghettos filled with hard drink and ironmongers. They certainly don't want to learn our language so we have to make signs in 'Black Speech’. And don't get me started on their cooking! Those rituals involving beating an animal to death with its own severed limbs, it’s just not New Zealandian." Those living near the Orc communities say that the quality of their lives and the value of their homes have been reduced since the influx from Middle-Earth. "How many times a day do we have to put up with the constant roaring of battle cries? The sound of the slaughter of their animals is horrific. Now they want planning permission to build a shrine out of the bones of their victims. It is making the residents of the old folk’s home nervous," said Billingsworth. "Mind you some communities have it even worse. Christchurch is full of Australians." Damn those Orcs! Coming over here and stealing our jobs, please send Nick Griffin! Not for support, more that to witness (first hand) a scimitar related murder. Man, I hate these Orcs. We have a few of them in our soccer (sorry, football) team and they are so greedy. I asked them, why don't they give the pass to me? and do you know what he said? "THOU SHALL NOT PASS !!!"